Uh oh. You come home unexpectedly from a boring movie and find dozens of teens staggering and vomiting among the daylilies. Or maybe you wake up because the bass thrum from the basement stereo is making your headboard vibrate. You discover the small sleepover for three you approved has become a pajama party for twelve girls and a pitcher of Cosmos. The police will tell you that your first call should be to them. Your child will tell you that you should leave. Your pastor will tell you that you must minister to the sick and ensure that all of the guests are safe from harm. Your defense attorney will say to put him on speed dial. Legality. Morality. Practicality. Choose just one path because that’s all you’ll have time to do before the situation worsens. Protecting your family, yourself and all the minors simultaneously may not be possible, the way many local Social Host Ordinances and civil liability laws are written. Crisis managers talk about the importance of triage; finding inebriated teens in your home is a crisis. So, here are some triage steps to try, if you discover your home being used by minors as a neighborhood bar. Be stealthy. Don’t come in yelling, or even announcing your presence. You have mere seconds to assess the situation. Remember, your goal is not just to stop the drinking; it’s to ensure that things aren’t worsened by your presence. When parents or police charge in, kids start running. That often leads to terrible accidents. How many are there? When the numbers are overwhelming, you need to call the police. A mom in Westchester County, New York was knocked down by a football player when she tried to make him stop drinking. A former principal in Spokane, Washington was punched and killed by a high school student when he tried to break up a party at an absent neighbor’s home. Your kid will be furious with you. 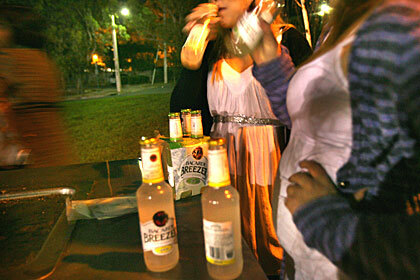 Parents of children who get cited for drinking will ostracize you. You may live to regret it, but the point is you’ll live and so will all of the unwanted guests. Does anyone look asleep or ill? Every parent should know the signs of alcohol poisoning. If not, read this. When in doubt, call 911. If you can’t wake them, call 911. Are they drinking or drunk? Kids who are drinking, will stop when you ask them to. Kids who are drunk, will ignore you or argue with you. If they stop, you then have the luxury of time to assess the situation and determine next steps. If they argue with you, you give them two choices: put down the alcohol or you’re calling the police. In either case, your minimum responsibility under many Social Host Laws is to contact their parents or guardians. Did they drive or walk over? Don’t bother asking the unwanted party guests for their car keys. They may lie or have a second set. To ensure the teens’ safety and to protect yourself against civil liability, forget the keys; you have to disable the cars. Many sites give advice about pulling fuses but you can’t open a car’s hood without the keys. Instead, grab a can of spray paint and cover the windshield thickly with paint*. It doesn’t damage the windshield (but avoid spraying the bodywork), it can’t be removed with window washer fluid, and even a drunk won’t try to drive blind. It takes time to scrape off the paint. At the very least, it buys you time. It also makes a great natural consequence for the would-be DUI driver. We’re not suggesting this is an easy scenario for anyone to handle. However, with a few deep breaths, a respect for the precarious balancing act that is parenting teens, and a little bit of luck, you — and your daylilies — will both survive. * Thanks to Billy Egloff of Billy’s Auto Repair in Briarcliff Manor, NY for the suggestion. If you don’t have spray paint, regular paint will do, although it takes longer.